Quite possibly the most heavily punctuated book of all time, Super-Villain Team-Up / M.O.D.O.K.’s 11 greets its readers with a summary so simple it brought a smile to my face. Rather than establishing what had been accomplished in the first issue with a wordy write-up, the inside cover lays out a photo montage of the entire cast and their specialized roles. It’s quick, it gets the job done, and it’s very entertaining. 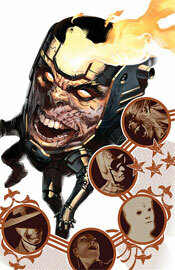 “This guy: (the brains of the operation, M.O.D.O.K.) is giving these guys: (the eight villains that play a part in the story) this: (five million dollars apiece) to rob this: (The Infinicide).” Establishes itself and stands out from the pack right out of the gates. I like that. Along those same lines, much of the dialog between villains is kept light and conversational, though M.O.D.O.K.’s speeches (god, I’m already sick of typing that name) can get pretty long-winded. I caught myself vegging out more than once as he laid out his master plan, but writer Fred Van Lente seems aware of the problem. He actually turns it around on the reader, as a few of the villains themselves lose their attention span during the monologue. As a book focused exclusively on the activities of super-villains, you’d have to expect a certain degree of ulterior motives, backstabbing and conspiracy, which Super-Villain Team-Up provides in excess. Nearly every single character has an ace up their sleeve or a failsafe backup plan that involves incriminating their peers. It’s nice to read something that’s so polar an opposite to what’s usually provided in a team-up book, but eventually it stops being unique and loses its edge. We’re still getting to know a lot of these characters, so the majority of this issue is spent fleshing them out and exploring their personalities. Problem is, only about half of the cast is deep enough to merit this kind of closer inspection and the lower-tier villains wind up doubly exposed for the effort. Now that I know Rocket Racer is a bit of an idiot who stutters when he speaks, does that make me care about his fate? Not really. Francis Portela’s artwork is enticing, and his light detail work gives the colors plenty of room to work their magic. The two facets work together in a way that bears more than a passing resemblance to Steve McNiven and Morry Hollowell’s efforts on the main Civil War book last year. Portela doesn’t hesitate at the prospect of rendering some of the more offbeat subject matter of a book like this, and he shows a good understanding of when to go crazy with a dynamic action frame and when to show some restraint. He’s got a firm handle on each of these characters, too, which isn’t always a guarantee on a team book. When its focus isn’t on a deep-seeded conspiracy from within or M.O.D.O.K.’s penchant for long-winded instructions, this is a fun book that doesn’t really have a peer. I enjoyed the way these overlooked villains worked together during their down time, but when the story turns a bit more serious near the halfway point, much of that is lost. Flip through this and enjoy the good stuff. If it were more consistent and could’ve resisted the urge to veer from its more humorous path, I’d have enjoyed it a lot more.